This is a guest post by John Jeglum. He is a retired peatland scientist who worked at the Great Lakes Forestry Centre, Natural Resources Canada, Sault Ste. Marie, ON, until 1994, and then at the Swedish University of Agricultural Science, Department of Forest Ecology and Management. He retired from Sweden in 2005, and returned to BC, first in Victoria, now in Duncan. Much of the material in this post comes from a webinar run by the Climate Action Network in May of this year. It was originally sent to Fraser Voices as an email that included attachments. When these came from internet sources, I have substituted links. You will recall the recent decision by the federal government to delay the institution of new procedures and regulations to reduce methane emissions in fracked natural gas and oil operations by 2 to 3 years. Part of this delay was owing to objections by the Canadian Association of Petroleum Producers (CAPP) to high extra costs for methane reductions (see Oilpatch accused of using ‘myth’ to delay Canada’s Climate Action Carl Meyer 2017), and part owing to the new Trump administration, especially with new EPA head Scott Pruitt, which may delay the application of procedures and regulations in the USA. Recently (18 May 2017), the Climate Action Network sponsored a webinar “How industry is constraining Canadian Climate Action on Methane.” Attached are three powerpoint presentations, and two sets of notes taken from oral presentations. The presenters are five knowledgeable persons with first hand information about the progress the industry/government’s program of constraining release of methane in the gas industry. Read’s presentation gives information on methane gas leakages from a number of pieces of equipment / structures / practices —fugitives (33%), venting (23%), pneumatics (20%), compressor systems (9%), well completions (1%), other (13%). The other presentations give their interpretations for the delay. Especially interesting was the final presentation by John Werring, which noted an absence of in-the-field inspection and monitoring. Monitoring of methane release has had rather little serious attention in NE BC. In the listing of known methane leaks, what is missing is an assessment of the methane leakage owing to leakage from the vertical and horizontal well bores. The vertical well bores consist of one or several nested steel pipes, sealed on the outside surfaces with cement. The cement surrounds each pipe, including the outermost pipe, and is meant to keep the fracking water, and returning water and contained liquids, inside the pipe. The horizontal steel pipe has holes exploded through it to allow for the water containing fracking fluids to be forced under tremendous pressures out into adjacent shale layers. When the forced injection of fracking fluid and sand (or other propping material) is stopped, the fracking water, containing methane and other carbonaceous liquids from the surrounding shale parent material, moves into the bore and travels up to the surface. It is not clear how far the the cement casing extends from the vertical along the horizontal bore. So probably not all the fracking water plus dissolved organics gets back into the horizontal bore pipe. Some may escape through discontinuities in the parent material or by travelling along the outside of the bore pipe to the surface. This results in loss of desired methane and other gas and liquid materials, which may bubble to the surface at the well, or at distance from the well into aquifers, surface waters and water wells. Fracking wells have demonstrated this kind of uncontrolled loss of methane, increasing for several years after fracking well abandonment (Ingraffia et al. 2013 and others, e.g. Cherry, Dusseault, Jackson). After well abandonment, the cement casements can develop cracks owing to natural ground movements, probably caused by earthquakes which are stimulated by fracking (Ingraffia et al. 2014). The degree of cracking increases over time after well abandonment, such that 40% or more of the wells develop leakages of produced water with methane other gases, carbonaceous materials, and fracking chemicals. These compounds can rise upwards and are the ones often reported as spilling over at the well sites, and contaminating groundwater aquifers, wells used for animal and human consumption, and surface waters. As part of the environmental assessment, methane and other compounds escaping from the drilled wells need to be assessed to get a complete picture of fugitive methane and potential groundwater contamination. Very few human and livestock groundwater wells are being monitored in NE BC for methane and other fracking contaminants, before, during and after fracking and gas production. The release of methane and other materials from the drilled well, increasing with time, is a major characteristic of fracked wells (ibid.). As fracking is presently conducted, the fugitive methane leaking from the gas wells, as well as the rest of the sequence of gas capture, processing, and pipeline transportation, wipes out any benefits that may be obtained by low emissions at final burning of the gas (Romm 2014). Many authors have noted that owing to large gas leakage, it is highly doubtful that natural gas can act as an effective bridge fuel (Magill 2014). With the rate of rising temperature associated with rising GHGs, can humankind really afford to put off serious and immediate action to minimize fugitive emissions of methane, a serious global warming gas? I don’t think we can afford to put off even by three years serious action on reducing fugitive emissions, establishing reasonable rates of carbon pricing, and lowering or removing subsidies to industries for fracking. The temperature curve is rising steeply, and knowledgeable climate scientists indicate that we need to start immediately a wartime level effort to reduce emissions. Dr. James Hansen declares that we need to start reducing the emissions by 2-3% yearly, immediately, to have any chance of keeping temperatures below 2 degrees (see new temperature chart by James Hansen). David Suzuki Foundation: New Science Reveals Unreported Methane from B.C.’s oil and gas industry threatens Canada’s international climate commitments. 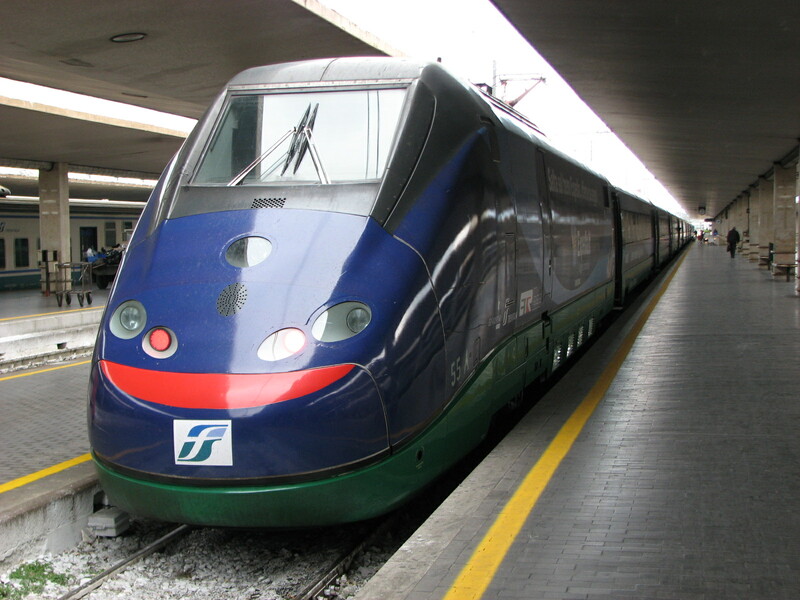 I have just booked online a train journey between Rome and Florence – and back. That’s 284km and will take about 90 minutes each way, on one of these. And just to compare I asked Google how long the trip from Vancouver to Seattle would take. That’s 227km and it says 3 hours and 10 minutes “in traffic” midday and ignores the line up at the border. By train the Amtrak Cascades schedule says 4 hours and 25 minutes. Or 3:45 on the bus!